Volcan, Panama is a small mountain town with a population of just 10,000. It most probably would never have come up on the retirement radar except for the unbelievable success of its nearby sister town of Boquete. Boquete's rise to retirement fame has been nothing short of phenomenal. The influx of so many North Americans has pushed property prices there out of the reach of most average retirees. High prices in Boquete however mean high potential for Volcan. Volcan has everything that Boquete has and more. Just count the places to eat on the main street alone; 34 and rising. 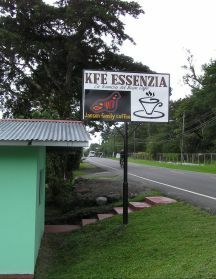 The newest are KFE ESSENZIA, a great little sandwich and coffee place where you can exchange books and enjoy a reasonably priced latte. This deli type restaurant is quickly becoming a hit with both the ex-pat and local Panamanians. Volcan's newest little eatery, proves that a restaurant can survive without serving the typical fare of beans, rice and fish. Owner, Eddie Buttner is trying hard to make this an "un-typical" Panamanian restaurant. My wife and I dined there the other Sunday and enjoyed a fresh salad followed by a wonderful spicy beef bourguignon. After two glasses of wine, chocolate brownie with ice cream for desert, the very palatable bill came to just $13. The speciality of the restaurant is rotisserie chicken. 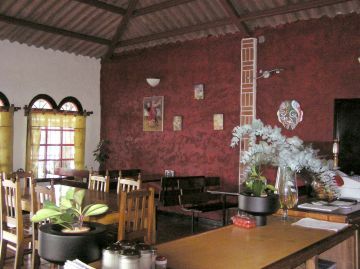 Situated in the heart of Volcan, Bocado's excellent food and great prices I am sure will make it a success. 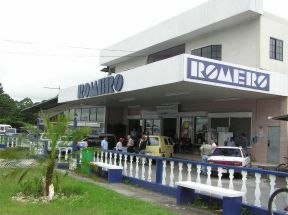 The ROMERO SUPERMARKET is a welcome addition to the three other well appointed Volcan food stores. The difference is that ROMERO has a modern, "customer friendly" attitude. Just ask them to stock up on "real" Cheeses, affordable imported wine etc. and voila! Within a week the items are on the shelf. The low prices and wide selection at ROMERO mean that the weekly trips to David are becoming less and less necessary. What Volcan really needs for it to move into the retirement destination "big" league are a few, sizeable developments. It seems, this is going to happen. A local realtor tells me that within the next few months, there will be the start of three large projects. A few months ago I spotted an excavator working on a road west of Volcan. These machines are expensive - $40 to $50 dollars an hour, so when I saw extensive road building taking place on a long stretch of country road, I knew that big bucks were being spent. I followed the graded and compacted road to a gate some 3 miles from town. This was the site of the Volcan Springs Ranch Estates. My wife and I climbed the gate and went exploring. 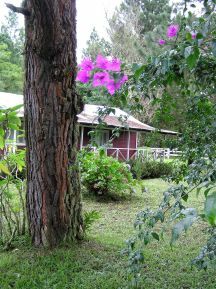 It was a fresh, sunny Chiriqui mountain morning. To my left I could see the towering peaks of the Baru Volcano, with its attendant wisps of white cloud swirling around its lower slopes. The property has small rolling meadows and already had the feel that thoroughbred horses should be cantering along its pristine grass slopes. I recall turning to my wife and stating," well, I think these people have found a perfect location"
Just this morning I received details from developer Ken Engle on what Volcan Springs Ranch Estates will have to offer. 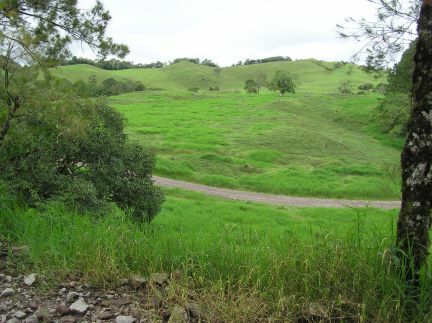 The property of a 133 acres will have 129, 1/2 acre lots. Some of the features will be: clubhouse, Café & Coffee bar, exercise room, sauna & spa, equestrian center and much more. The lot sizes will vary between 2,000 and 2,5000 square meters and prices will start from around $70,000. That's roughly $30 a square meter - compared to the average of $50 a square meter in Boquete, makes Volcan Springs almost sound like a bargain. Ken Engle says future developments at the springs included the building of between 30 and 40 condominiums. Volcan, will be a much different place within two years. However, not everyone thinks change is a good thing. Most local ex-pats don't want this town to be a carbon-copy of Boquete. I don't think that's going to happen for several reasons. First, Volcan has more wide open spaces for development. Secondly, the people that want to live here are demanding something different from the "gated gringo communities." 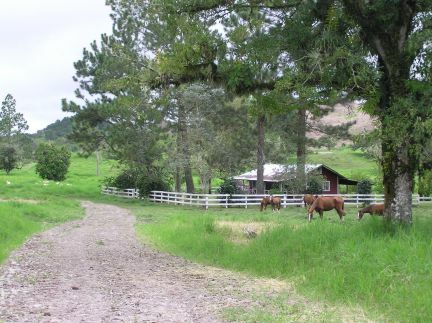 Volcan Springs Ranch Estates, with its larger lots, equestrian life style and affordable pricing, can only be a positive addition to the town.